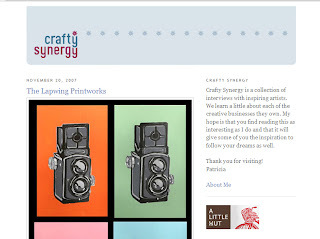 We were recently 'interviewed' about our work for Crafty Synergy, a blog with a collection of interviews by different artists. Our interview has just been published! You can read it here. 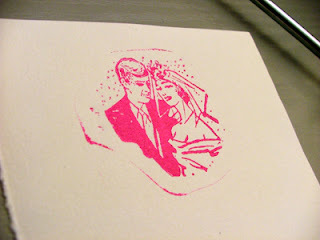 Today my new pink ink arrived in the post (along with a new silver ink, tools and more wood blocks), so tonight I experimented with a 1970s wedding block bought on ebay in a mad moment. 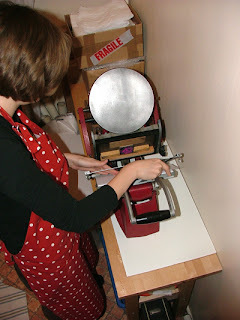 We still don't have any rollers, so I hand inked the block with our tiny roller instead. I think I'm getting the knack of how much pressure to use on the handle now, and it didn't take long to rattle a dozen notecards off whilst our pasta was cooking. It was such good fun I've decided to turn them into proper cards rather than just test cards, so I'm going to add some text this weekend in my new silver ink! I think Jon is almost won over by the thought of bright pink ink, it certainly beats the boring tubes of black ink that came in the same order! 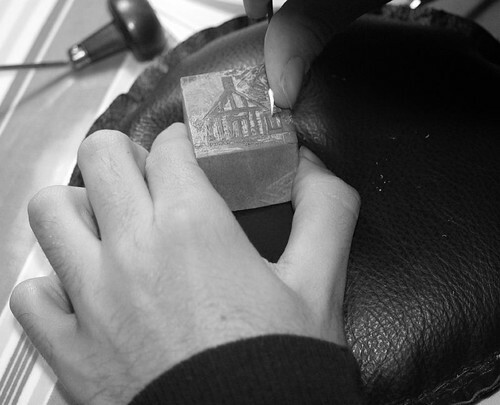 After letting the block sit on a shelf for a long time Jon has been busy adding some finishing touches to his wood engraving of St Winifred's Well (the Landmark Trust property that we stayed at in May), after a test print or two showed up some areas that needed more cutting. 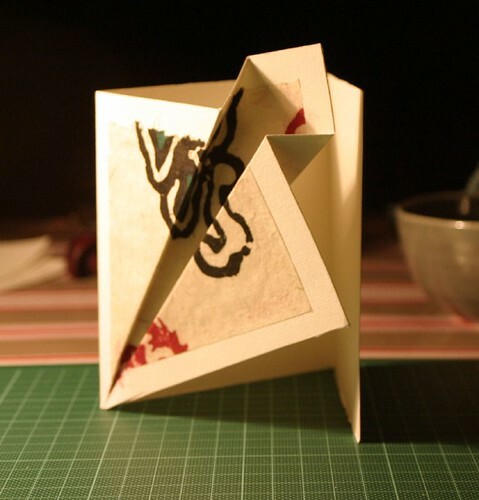 I have been busy making prototype wedding invitation cards using thin card and a square of thinner block printed paper. It took a couple of cards to get the folds quite right, but I'm really pleased with how they've turned out. 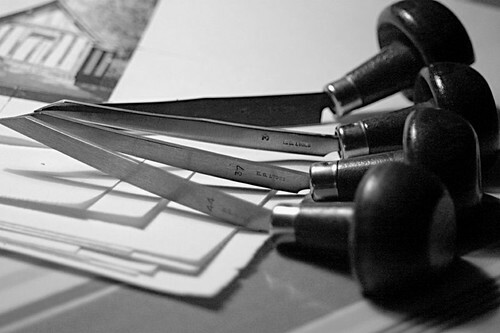 The final invitations are going to have a different patterned paper on them, and letterpressed text inside. Fingers crossed, they'll be ready to go out to our very small number guests at the end of next week... Hooray!